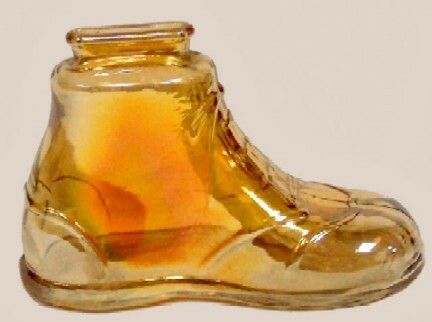 Anchor Hocking Glass Co. was established in 1905. 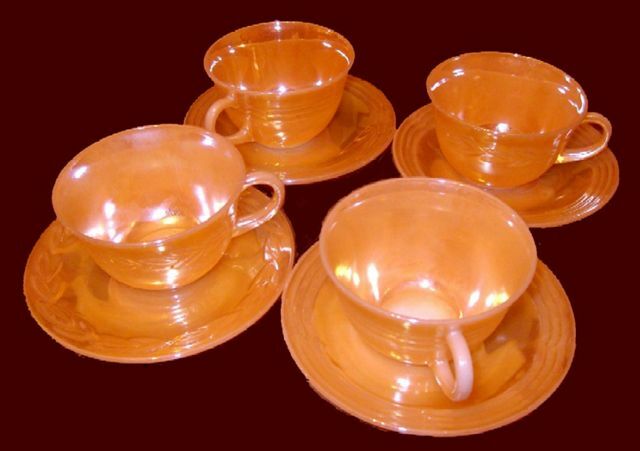 Lancaster Glass was in business from 1908 to 1937, when Anchor Hocking bought the company. 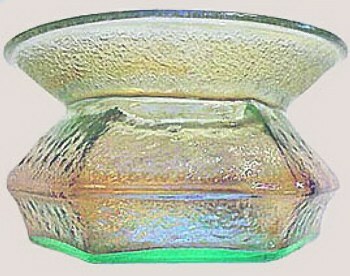 Newell Corp. acquired Anchor Hocking Glass Co. in July 1987. Following many changeovers in production and ownership, cost-cutting ventures were not enough to sustain operations. In April 2006, Anchor Hocking filed for Chapter 11 bankruptcy protection. 9 in. URN Vase on the left - CRACKLE Lamp on right. HANDLED URN: While this urn is classified as an Anchor Hocking product, we all know that molds are circulated among manufacturers over time. An ebay seller listed this piece for sale in November 2008 describing it as such: Made by Turner Glass Co. of Terre Haute, IN – 1905-1930, noting an inverted T within a triangle, along with #9 down inside the urn. 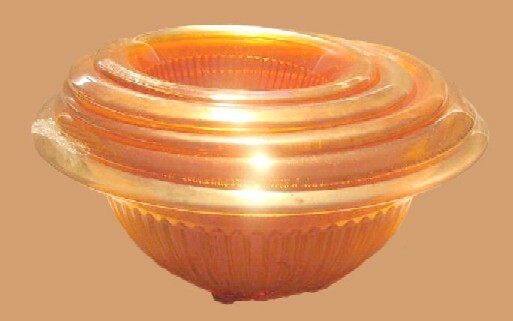 OIL LAMP: Has the same “pebble surface” as the Urn, so it’s natural to believe that it was produced by Anchor Hocking. Nest of Anchor Hocking Mixing Bowls - 7 in. & 10 in. included. NEST OF MIXING BOWLS: Appeared for sale on eBay in Dec. 2009, with a price tag of $125. Sizes given: 11 ½”, 10 ½”, 9 ½”, 8 ½”. 4 in.tall x 7 in. diameter - Green & Marigold. and Mid-Winter 1927 Butler Bros. Ad. 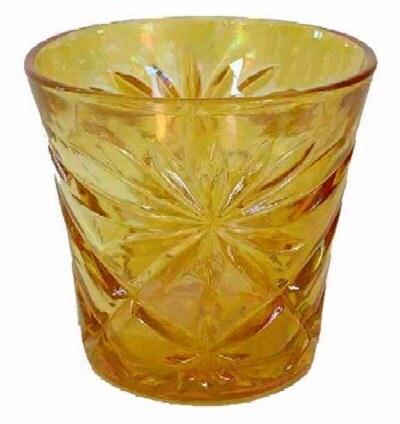 Anchor Hocking - Vaseline HOBNAIL SODA GOLD CUSPIDOR. HOBNAIL SODA GOLD Spittoons: Perhaps there are other colors available, but we have not seen them. 3 in. high, 4.5 in. deep, 2.25 in. wide. BOOTIE Bank: This shape is a “neat” idea for a child’s bank. 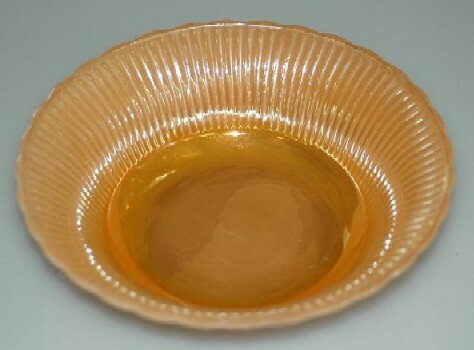 Anchor Hocking (Fireking) Marigold over Moonstone. 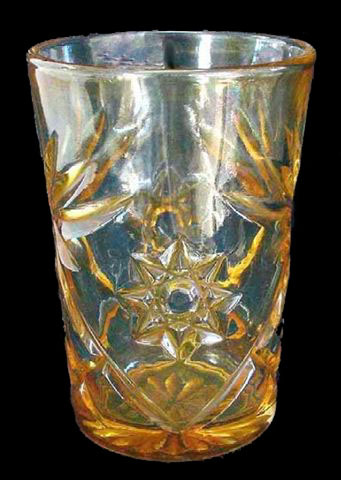 MUG: The Fireking glassware has much the same appearance as marigold over moonstone; however, the result is a much glossier finish. ROYAL LUSTRE 8.5 in. Bowl. - Anchor Hocking. ROYAL LUSTRE Bowl: This appears to have a moonstone base? It creates a lovely appearance. 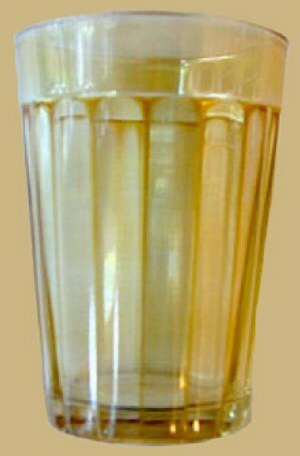 FLUTE Juice Glass by Anchor Hocking. Press Cut - Anchor Hocking - 3 in. high. 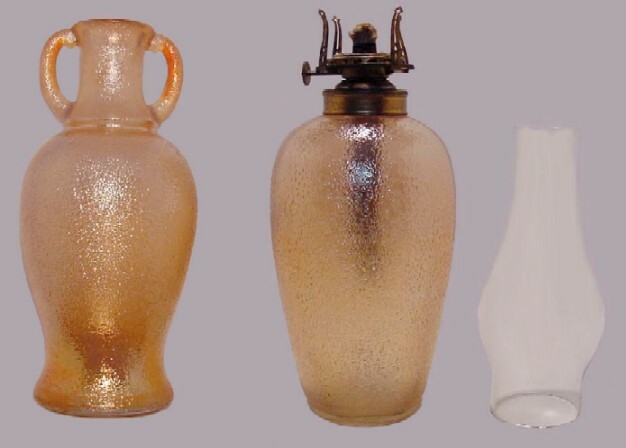 3 TUMBLERS: These were included in the tumbler collection of the late Cecil Whitley. nor shall you gather the gleanings of your harvest. Nor shall you profane the name of your God; I am the Lord. You shall not cheat your neighbor, nor rob him. The wages of him who is hired shall not remain with you all night until morning. but shall fear your God: I am the Lord. Nor honor the person of the mighty. In righteousness you shall judge your neighbor.